Benefiber provides dietary supplements for a healthy lifestyle.Their supplements help overall good digestive health as well as making you feel fuller longer. 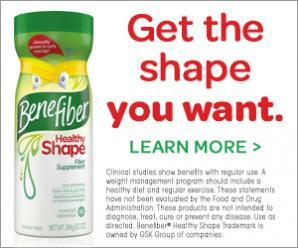 Benefiber Healthy Shape Dietary Fiber Supplement is clinically proven to help you feel fuller longer. Benefiber Healthy Shape is a 100% natural, clear, taste-free and completely dissolvable daily supplement that helps you consume fewer calories and curb cravings. Add it to drinks, bottled water and your favorite recipes. Read our bloggers’ reviews and find recipes that contain the Benefiber Healthy Shape Dietary Fiber Supplement you will surely love. Success in Weight Management Sweepstakes on BlogHer runs from 8/8/2016 through 9/8/2016 and is only open to individuals who, at the time of entry deadline, are legal residents of the United States and are 18 years or older. Click "here" to read the official rules. Winners will be randomly selected from all eligible entries. Good luck!